Michael Phelps has become the first American male swimmer to qualify for five Olympics. He won the 200-meter butterfly race at the U.S. Olympic trials on Wednesday. Phelps has won 18 gold medals, more than anybody in Olympic history. He won eight gold medals in a single Olympics in 2008 in Beijing, China. But his golden image was tarnished after the 2012 London Olympics. He was arrested two times for drunk driving. He stepped away from swimming. He entered a rehabilitation program. He then returned to the pool to train for the Rio de Janeiro Olympic Games. The Games' opening ceremony is August 5. Phelps first appeared in the Olympic Games in Sydney, Australia, in 2000. He was 15 years old. Now 31, Phelps still holds three world records. He says he is happy to represent his country at the Olympic Games one more time. "Being able to make my fifth Olympics is something that means a lot to me," Phelps said. "...I think 20 years from now, I'll be able to look and be happy with that decision to come back." 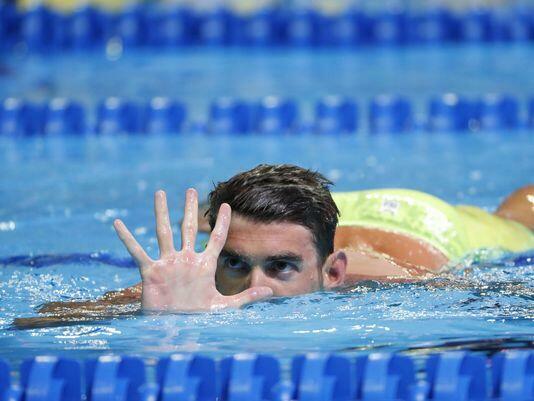 Another goal for Phelps is setting one more personal best time during the next month. "It's been a long time since I've got a best time," he said. "I'd like to have maybe one before I retire. I hope we can get at least one in the next four weeks." When the Rio Olympic Games begin in August, Phelps will be joined on the U.S. swim team by Allison Schmitt. Schmitt is another athlete who won gold medals in London in 2012. But she has struggled in her personal life since winning gold. For Schmitt, it was depression that included suicidal thoughts. It was not until her cousin committed suicide that she looked for help. She qualified for Rio on Wednesday after placing fourth in the 200-meter freestyle race. She won that event at the London Games in 2012. "I'm going to Rio," Schmitt said. "It's been a tough four years, but I'm so happy right now." The star swimmer of the 2016 summer games may be 19-year-old Katie Ledecky. In 2012, she was a young swimmer from the suburbs of Washington, D.C. Ledecky won a surprise gold medal in the 800 meter freestyle in London. In less than four years, she broke three world records. At last year's world championships, Ledecky won five gold medals. She says she will not try to break German swimmer Kristin Otto's record of six gold medals at a single Olympics. "I don't think about who I'm chasing or any of the historical implications," Ledecky said. The U.S. team will also feature Missy Franklin. She is a four-time gold medalist at the 2012 Olympics. She will race in the 200-meter freestyle event in Rio. He was awarded the gold medal for being the fastest runner. The man was Booked on the charge of drunk driving. They ask him to attend the opening ceremony. 1.He stepped away from swimming. He entered a rehabilitation program. Tears spilled from Peter Langmore's eyes as he stepped away from the grave. Before she could embrace him he stepped away. 2.But she has struggled in her personal life since winning gold. She knew nothing about his personal life, or what he was really like. She had no personal life and no private psychology.